Today, I wanted to talk about Nails, It's a big hit that you either get your nails did by a nail technician using gels or acrylic or go for the famous easy to do "glue ons". Please keep in mind that these pictures where taken around 2 years ago with my beloved Iphone 3GS back in the day where my Beaut CANON baby hadn't met me yet. Keeping on track, Melissa from Nailene had sent some items over to me 2 years ago to try out. Inside where an assortment of items as seen above, nail stickers, glue, packets of nails and even a pack for the toes! I have had everything on my nails, Professionally made gel's and i dunno why but with my nails being so soft and sensitive for me, these ''glue ons'' have been the best out of the bunch for me. I do remember wearing the 'Runway Designs' the Silver ones and a client had actually asked me who designed them for me thinking they were professionally made! So these do fool people into thinking that they have been done by a nail technician. They usually last around about 1-2 weeks then you get that odd one or two falling off, so ladies i would suggest carrying around the mini glue in your handbag just incase. 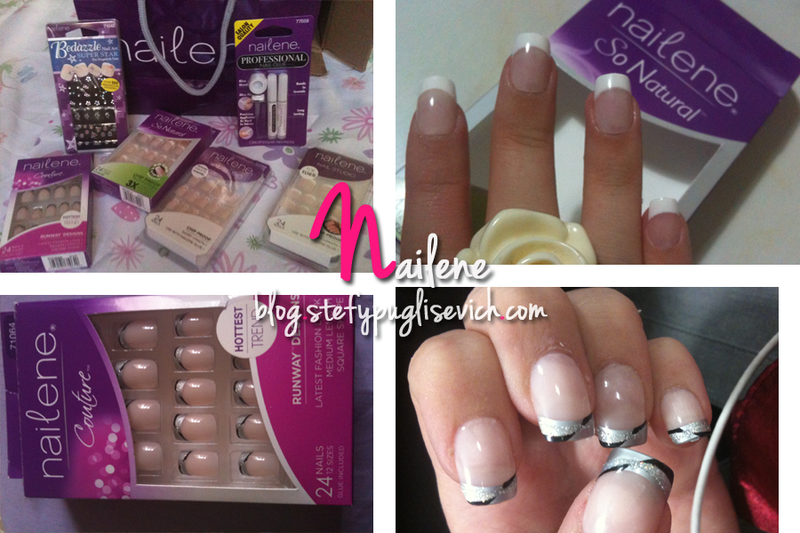 But on the other hand, if you are looking for a natural 'French Manicure', the ''so natural'' by Nailene are the best on the block, they look very clean and realistic and price wise you can easily find them in your local pharmacy for around about €11 or so. And they are relatively easy to find in any pharmacy or beauty shop! Ah i know alot of friends that actually do that! just get a gelish done instead so the polish lasts longer! its a good idea tho with my nails its pointless and i love having abit of length to my nails! i used to love these back in the day!